Join us in protecting the Gila River, New Mexico's last wild river! The Gila River needs our help! The Gila River is under threat from a diversion project that could cause irreparable harm to New Mexico's last wild river. 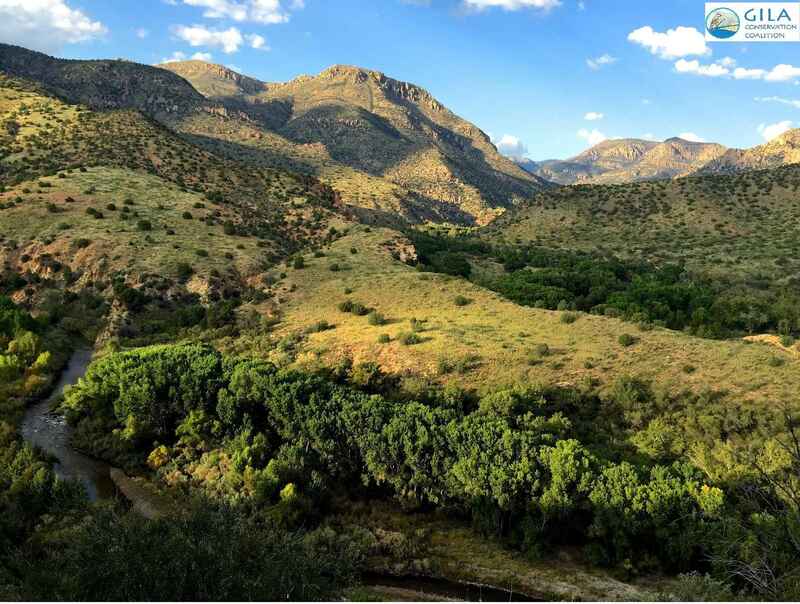 Originating in America's first designated wilderness area, the Gila Wilderness, the Gila River is rich in biological diversity and cultural history. Riparian ecosystems comprise less than 1% of New Mexico's arid landscape, and the Gila's natural cycle of flows supports outstanding examples of southwest riparian forest, cold water fisheries and a remarkable abundance of wildlife. The river is critical to the long-term health of wildland ecosystems, including the Gila Middle Box Inventoried Roadless Area, Gila Lower Box Wilderness Study Area, and the Gila Box Riparian National Conservation Area. The Gila River's gallery forests are high value bird habitat supporting one of the highest concentrations of breeding birds in America including the federally endangered southwestern willow flycatcher, and other regional specialties like the common black-hawk, Montezuma quail, and the elf owl. The Gila River also provides one of the most intact native fish communities in the Lower Colorado River Basin including the federally threatened loach minnow, spike dace, and Gila trout. Referred to as "the nation's most variegated stream fishery," the Gila also supports a naturally reproducing sport fishery where one can catch a wild trout, smallmouth bass and catfish out of the same pool. The Gila provides significant economic value to the region in terms of unparalleled opportunities for outdoor recreation, nature-based specialty travel and wilderness experience. With the passage of the federal Arizona Water Settlements Act of 2004 (AWSA), a small but influential group of farmers, business interests, the New Mexico Interstate Stream Commission, and the newly formed New Mexico Central Arizona Project Entity are advocating for construction of a diversion project that could harm the unique ecology of the Gila River. Economic and legal analyses support less expensive and sustainable alternatives to construction of a diversion of this wild river. Cost-effective solutions, such as municipal and agricultural conservation and sustainable use of groundwater supplies, could meet the region's future water needs. Under the Act, New Mexico can receive approximately $90 million to implement non-diversion alternatives to meet the future water demand of the region, while maintaining the Gila's instream flow and saving tax payers and water users millions in an unnecessary and ecologically destructive project. Please donate today and help us protect the Gila River forever! Organized in 1984 to protect the free flow of the Gila and San Francisco Rivers and the wilderness characteristics of the Gila and Aldo Leopold Wilderness areas, the Gila Conservation Coalition (GCC) is a partnership of three organizations - Gila Resources Information Project, Upper Gila Watershed Alliance, and Center for Biological Diversity - that promote conservation of the Upper Gila River Basin and surrounding lands. Gila Resources Information Project serves as GCC's fiscal agent. As an archaeologist working in Southwestern New Mexico, I know how important the Gila River was to the prehistoric people who relied on it. Honoring a genuine Sportsman....we need more. The Gila River is beautiful and should be protected. Saying again how much I enjoyed The Gila River Festival 2018. I learned a lot. The achievements of the GCC are impressive- happy to be a supporter. It would be difficult to live in Southwestern New Mexico without knowing that GRIP is on the case, expressing our ideals, advocating for our future. Because protecting the Gila is perhaps one of the important priorities I can think of as a resident of Silver City. Merry Christmas!